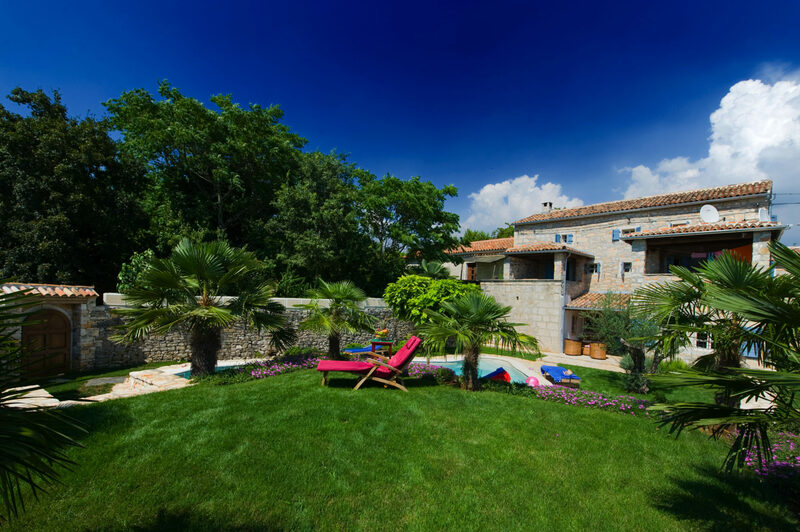 Villa Sanja is a secluded villa in an idyllic countryside setting for a perfect, peaceful retreat from the hustle and bustle of modern life. 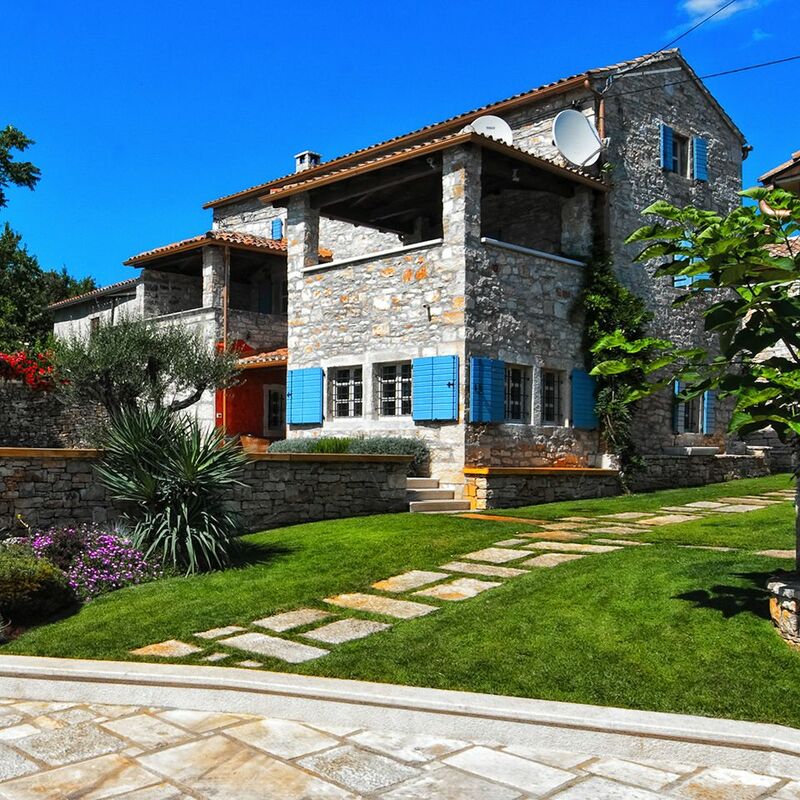 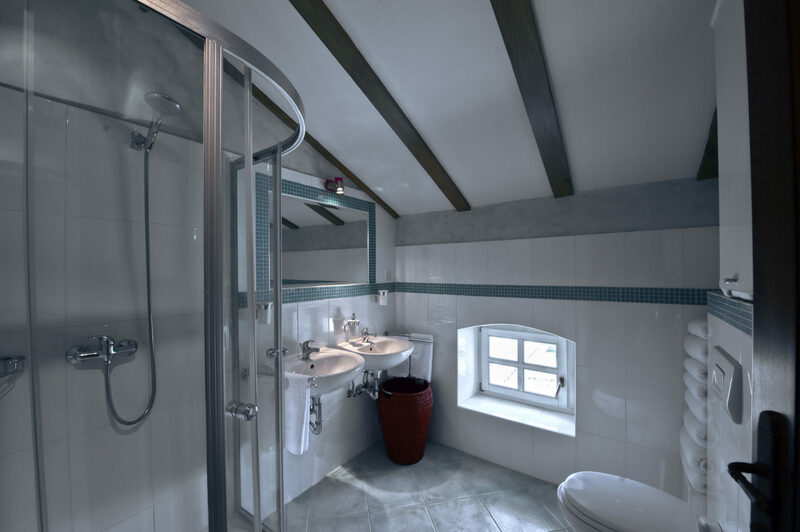 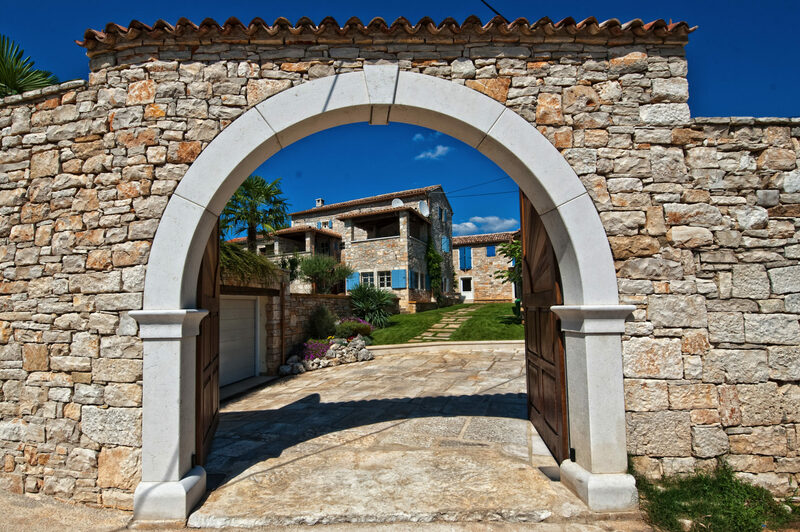 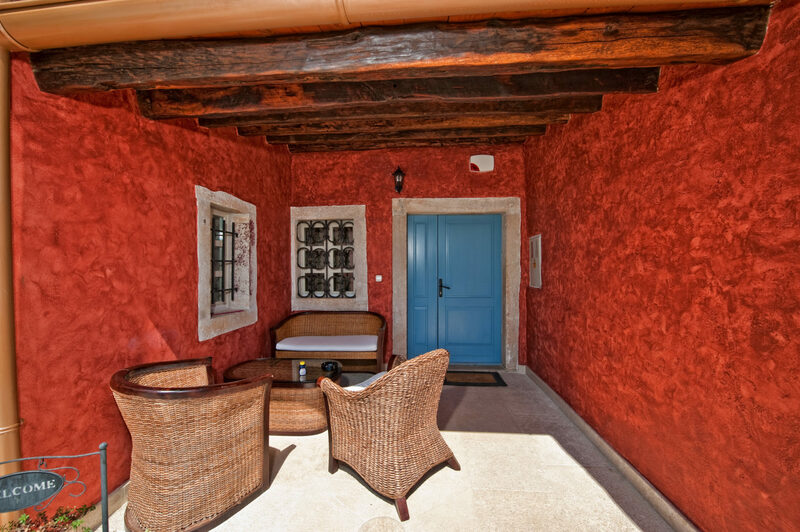 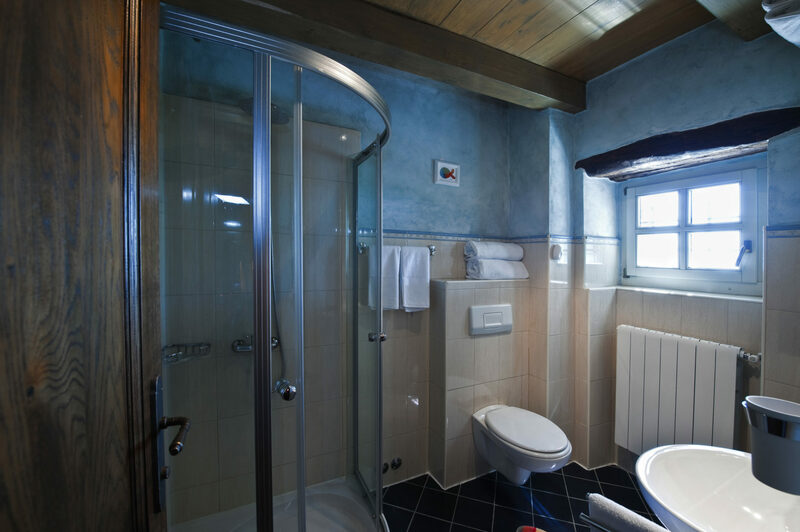 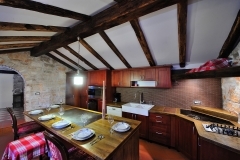 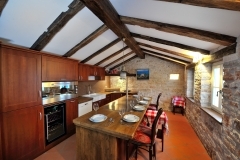 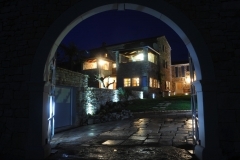 It is only a short drive from the tourist and historical centers of Istria. 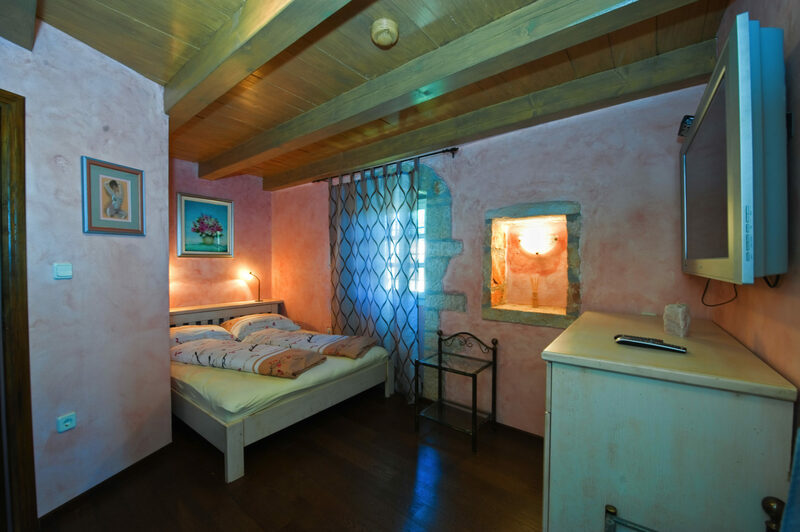 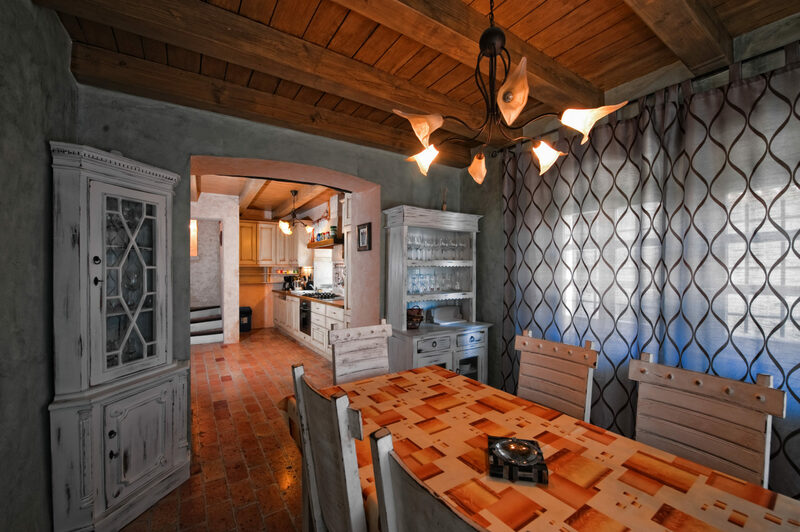 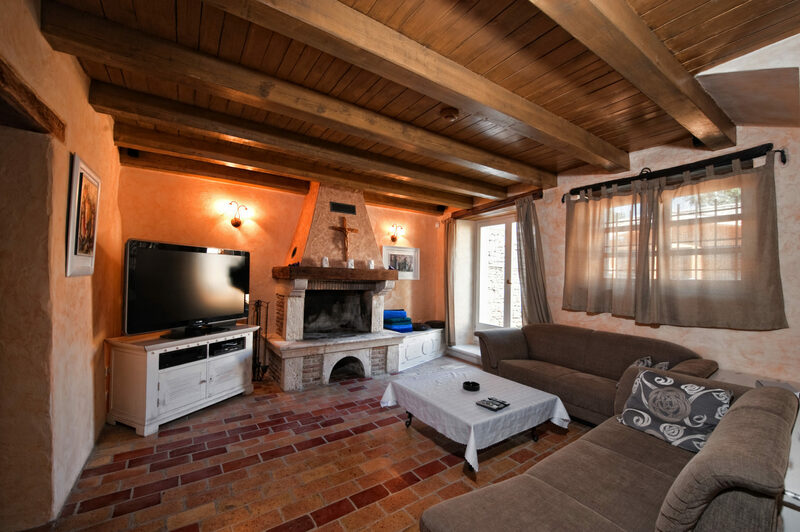 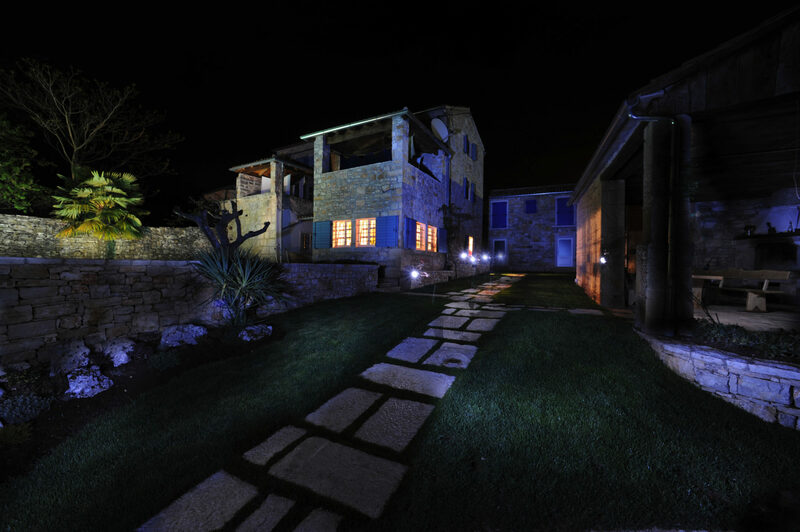 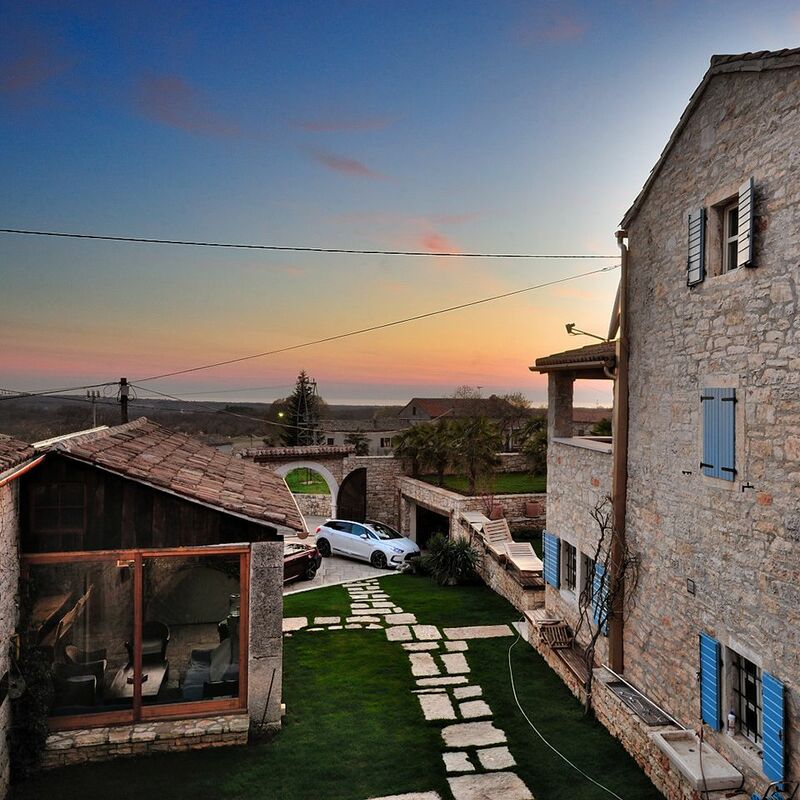 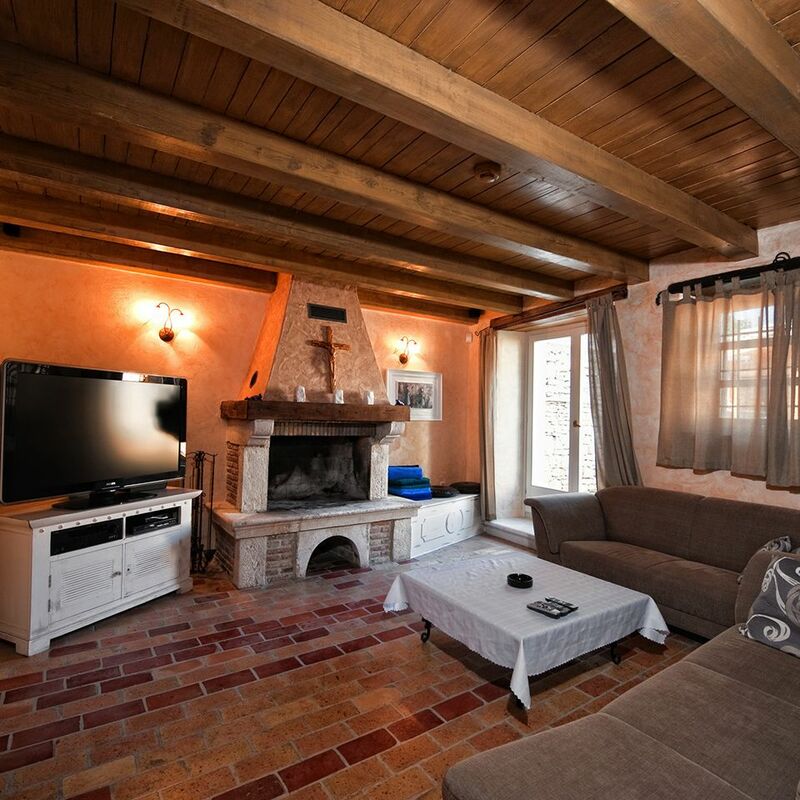 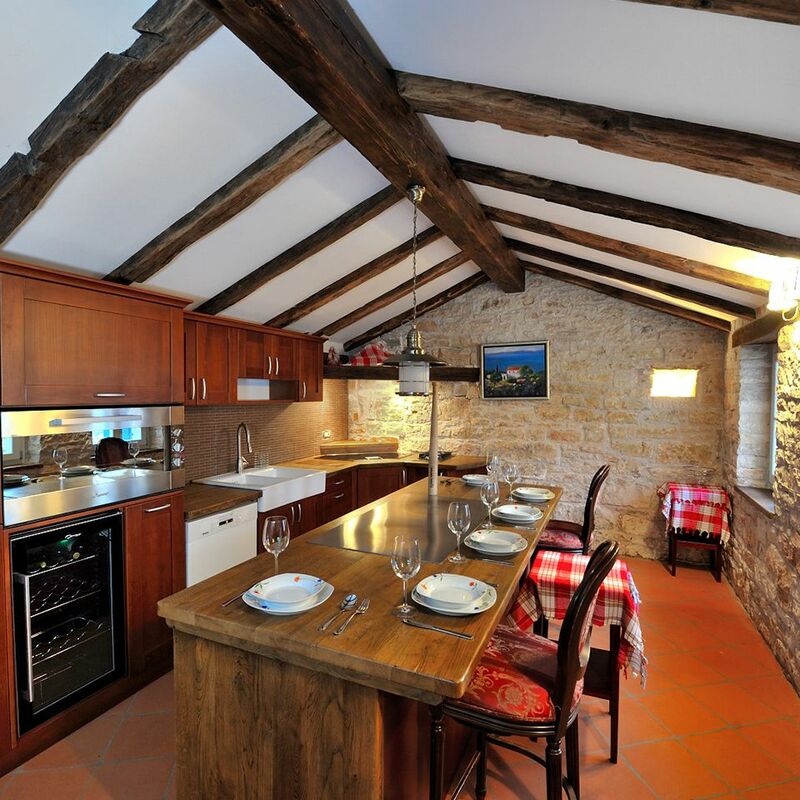 In the quiet and beautiful central Istria, this fantastic 4-bedroom stone villa (passive house) with all en-suite facilities and heated swimming pool provides a romantic retreat for couples / families. 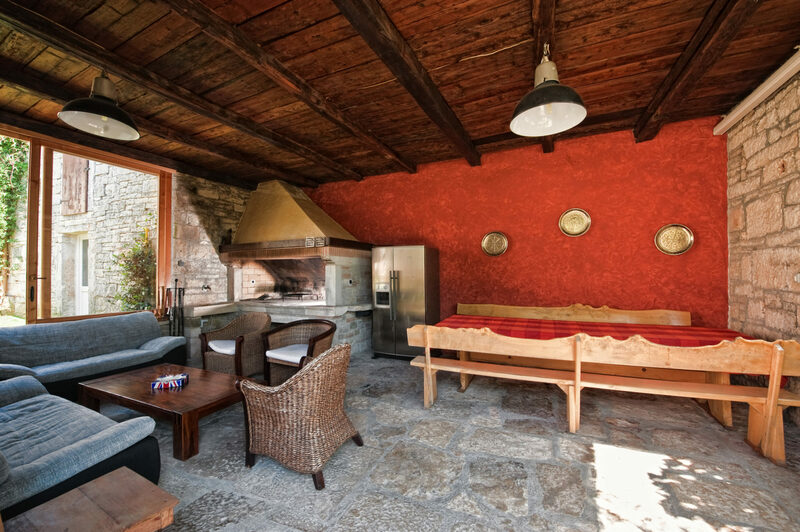 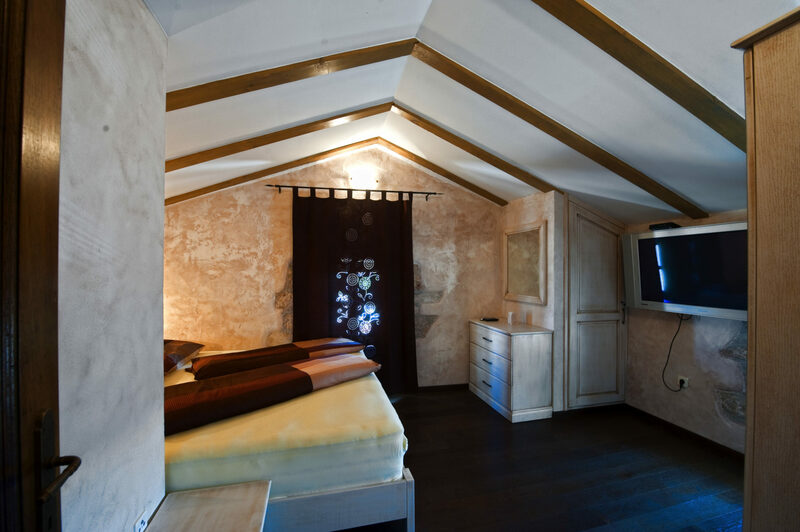 There is room for ten people in the stone house of 225 m². 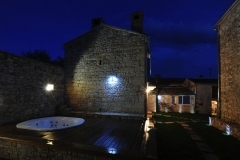 It is in perfect harmony with the countryside and has been adapted to the traditional architecture. In the property you can relax in the beautiful teak Jacuzzi or in the sauna. 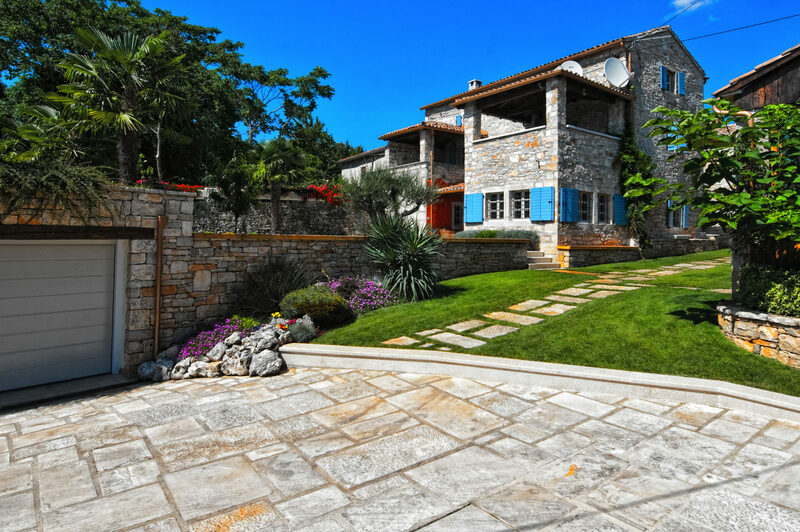 The villa was built with local stone and other natural materials. 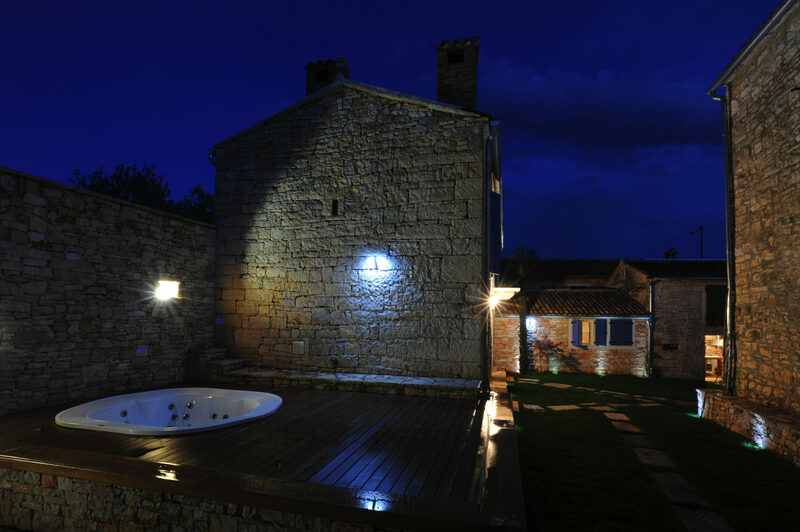 From the verge of the holiday house, you can enjoy the evenings and the stars strewn with stars. 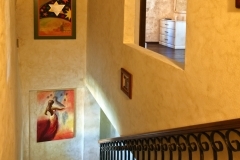 Enjoy a glass of wine while admiring the magical sunset and fantastic sea views. 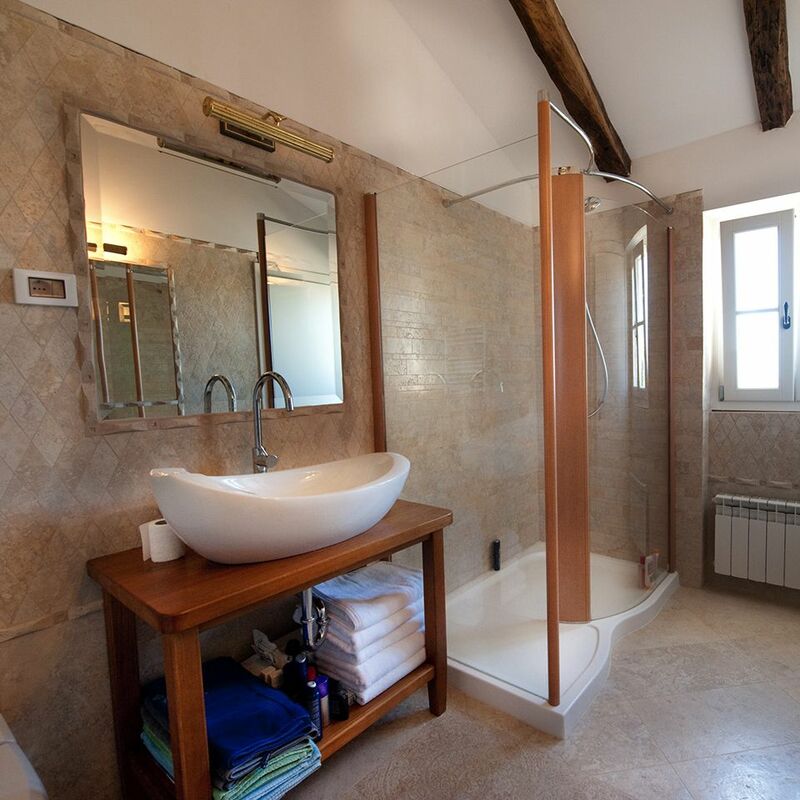 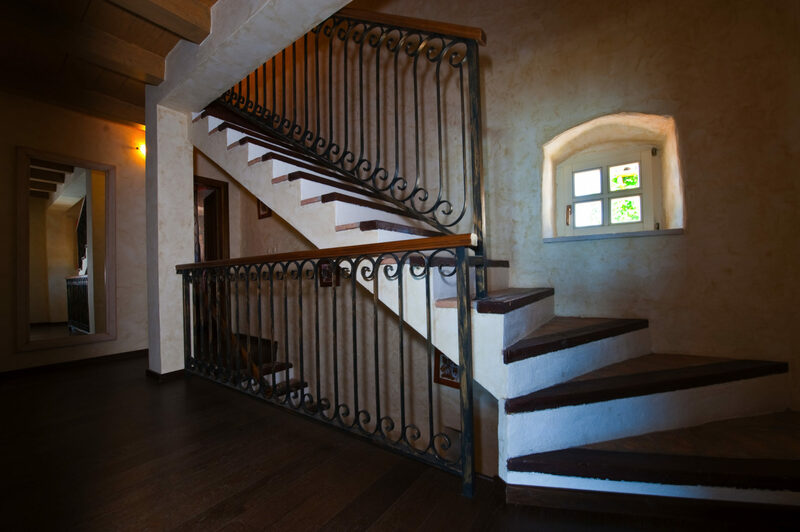 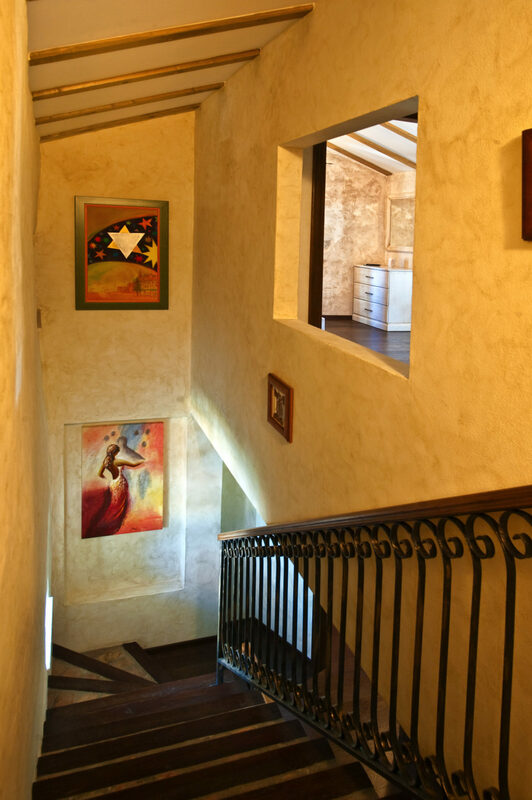 Ground floor: 1200 m2, completely fenced with a 3m high wall that protects your privacy. 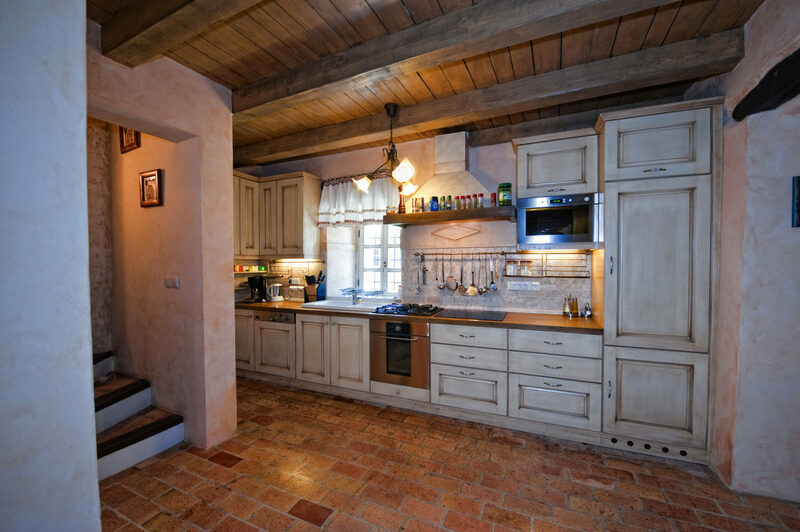 The larger of the two houses has 4 bedrooms, 4 bathrooms, a fully equipped kitchen and an open fireplace in the living room. 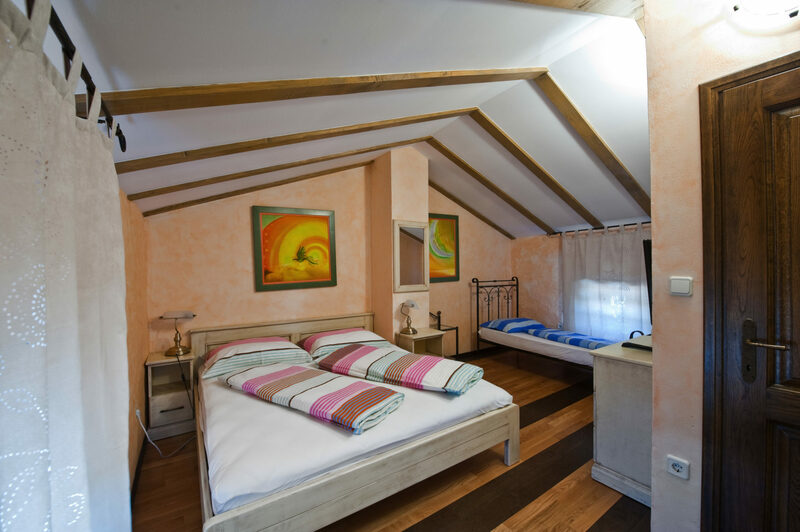 The smaller house has 1 bedroom (50 m2), 1 bathroom, an extra toilet and a living-bedroom (50m2) and a fully equipped kitchen. Furthermore, the summer kitchen (45m2) with the large open barbecue area invites to evening barbecue parties. 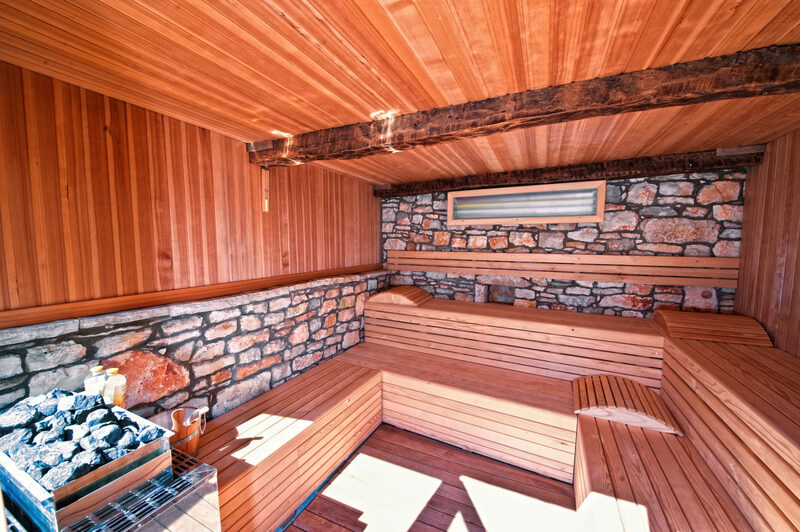 Of course, there is always enough firewood for both grilling and heating. 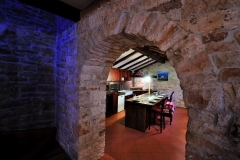 2 large tables offer enough space to spend the evening comfortably with the grilled delights and a glass of wine. 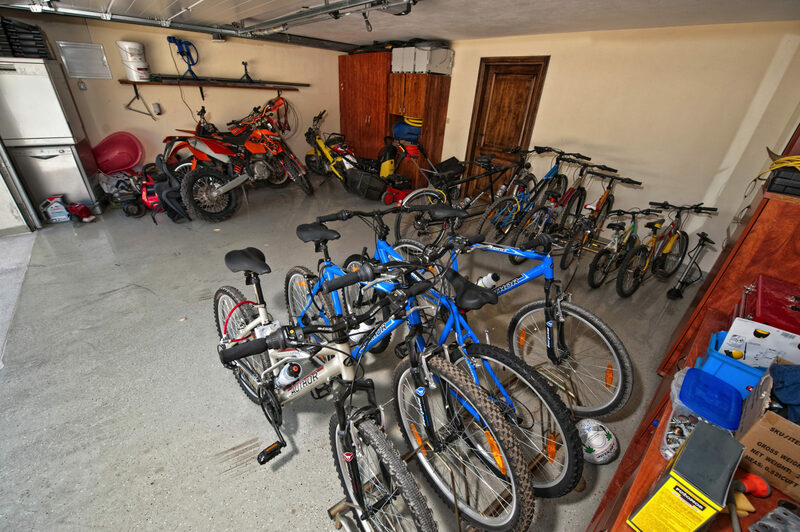 Also in the neighborhood the purchase of organic food (eggs, salad, potato, …..) is possible. 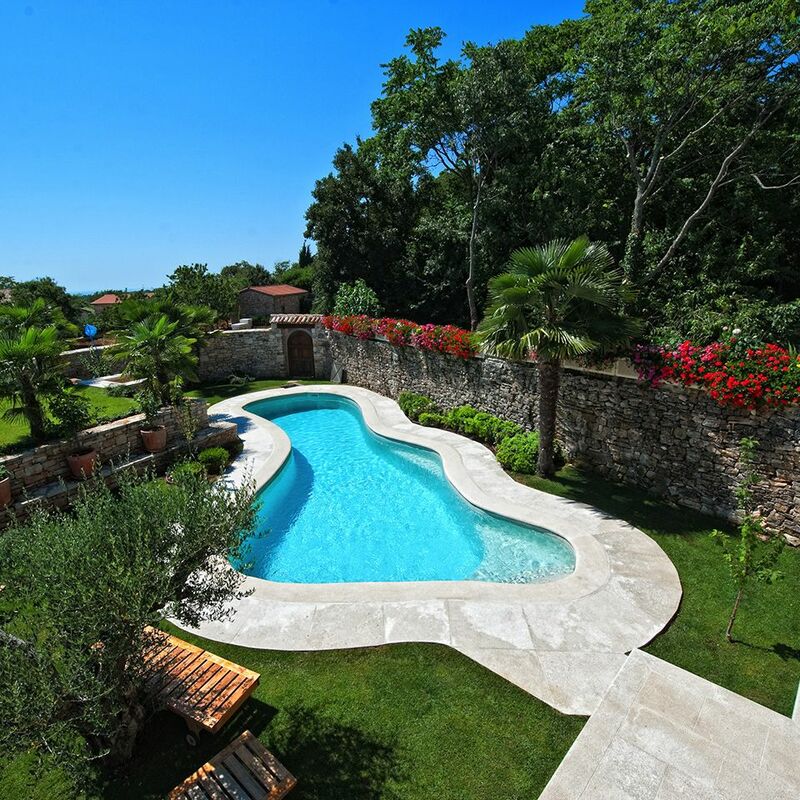 The beautiful pool thrills children and adults alike. 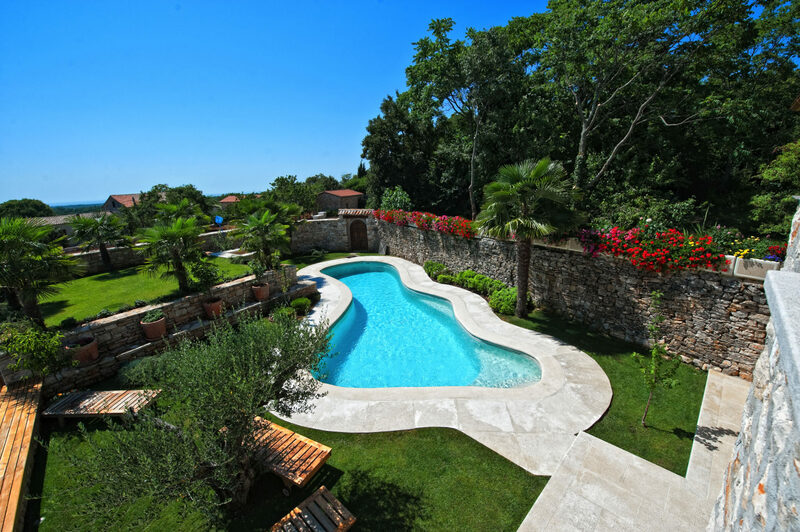 Furthermore, the jacuzzi, the sauna and the lawns surrounded by palm trees, flowers and fruit trees ensure the perfect relaxation. 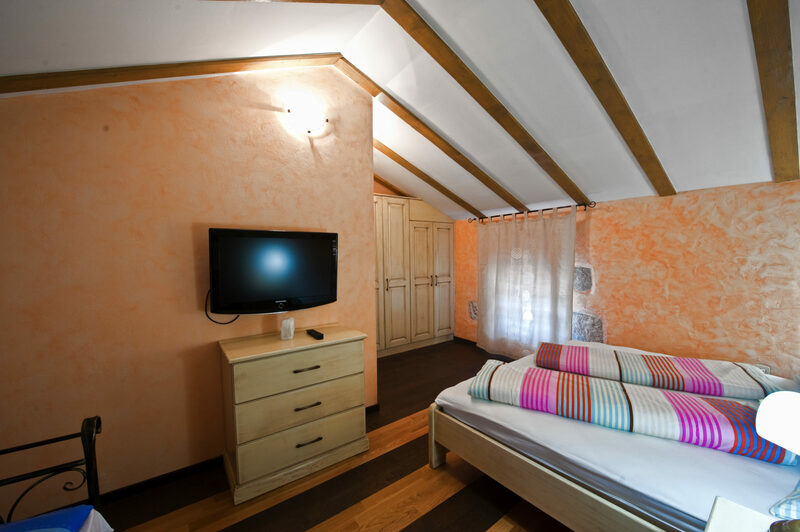 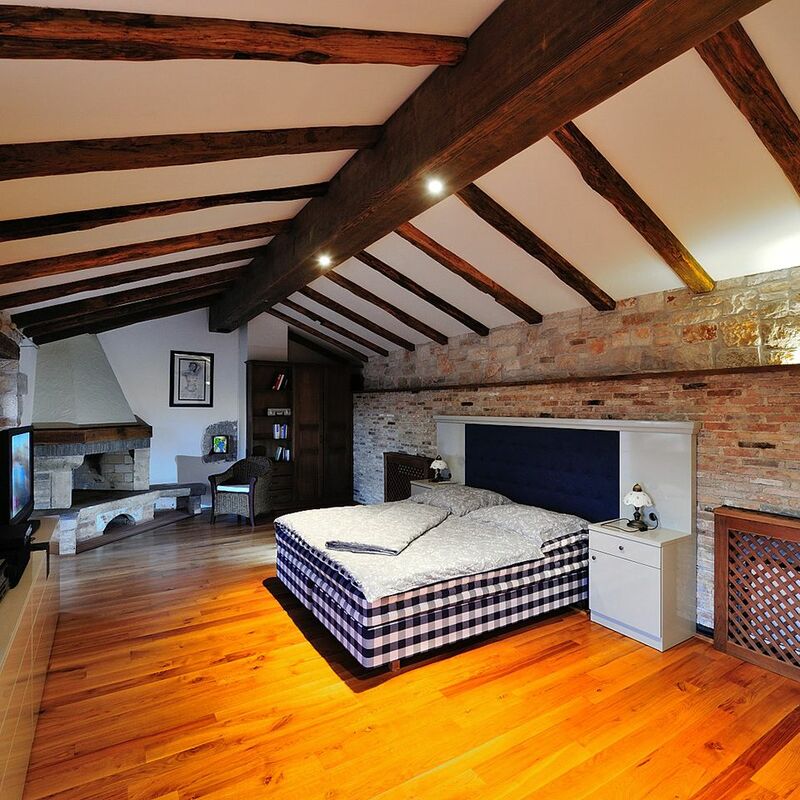 All rooms are equipped with extra comfortable mattresses (40 cm thick).